The contemporary or modern house enjoys more and more popularity in Quebec since the early 2000s. This style of construction is also called the modern home. The group of entrepreneurs and professionals in architecture, design and construction of New House Construction under the direction of Mr. Daniel Dargis, Engineer, helps individuals, entrepreneurs and real-estate developers with the realization of dream projects. or with a customized service by performing a specific task for the realization of the modern contemporary house: technical advice, 3D sketches and conceptualization, architectural plans, engineering plan, estimates, mounting of the framework and the structure or by providing subcontractors. Do not hesitate to contact us for the design and the turnkey or partial construction of a contemporary or modern house. by the simplistic philosophy of communist Russia highlighting a more refined art, less elaborate, more appropriate to the social system of workers, which has led to the appreciation of geometric and cubic forms in construction. by the influence of German art around 1918 during the First World War using steel, concrete and glass devoid of stylistic references and based on industrial and socialist ethics. The architecture of the modern house has therefore evolved through European architects of French, Swiss, German and Russian origin such as Le Corbusier and Walter Gropius, father of the German Bauhaus school of architecture in 1919. Today, France and Germany are leaders in the architecture of the contemporary and modern house. Quebec welcomes more and more professionals from France, amongst them architects who cooperate in the evolution of the contemporary house in Quebec. Sketches and models: The goal here is to produce sketches that will serve as a basis for designing a contemporary house plan. An expert from the New House Construction group from Construction Daniel Dargis Inc. meets you to listen to you and reconcile: goals, tastes and budget. In this first stage we collect the information you have on hand: ideas, photos, images, plans, sketches, drawings, a budget, tastes for materials and colors, dimensions and shape of parts. To this we do research on zoning regulations for the construction and then we begin to design sketches in the form of proposals. The permit and construction: Once the plan of the modern house is complete, it is presented to the municipality to obtain the permit and the construction work can begin. Mr. Daniel Dargis, Engineer and general contractor in Montreal, leads a group of professionals and general contractors who come together to design the model of the modern contemporary house of your dreams, from A to Z, from sketches, through plans to suit your tastes, a budget, and then they carry out the turnkey construction. Unlike other styles of homes the architecture of the contemporary or modern house fits very well into old neighborhoods combining a nice contrast of old and modernity or into green spaces in urban areas or in the countryside. We often see, for instance, in Montreal, as in other cities in Europe, the construction of contemporary or modern houses between buildings in old quarters of all ages. Our architects and designers firstly care to meet you on site to look more closely at the location and then discuss with you your tastes and needs for your contemporary house. In Quebec, although the contemporary house becomes more and more popular, one finds the style of contemporary construction especially in new commercial buildings such as restaurants, office buildings, daycare centers, warehouses, manufacturing plants and even agricultural buildings. In our team you will find experienced designers and architects who have carried out construction projects of all types of budget, not only in Quebec but also in the USA and abroad, and who will share a wealth of original ideas with you to make your project of a modern house or commercial building a unique one that meets your needs and your budget. In general, the construction of a contemporary or modern house is not very different from building a different style of traditional home. The construction stages are the same: excavation, shell and structure, roof and interior and exterior finishing. Owners of a contemporary or modern house usually have a particular taste for design, energy efficiency, the use of primary materials such as wood, concrete, glass and natural elements such as the sun, vegetation, water, fire and even the wind. To this is added the lighting composition through playful projection of light and even animated projections on surfaces that give the contemporary house a spectacular charm. Long kitchen surface areas such as concrete countertop or natural stone. 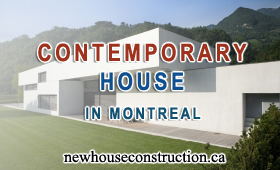 The group of general contractors in Montreal, specialized and professional designers, architects and engineers of New House Construction under the direction of Mr. Daniel Dargis, Engineer, helps you individual, business people, general contractor, promoter and real-estate developer with the design and build your contemporary or modern house project.